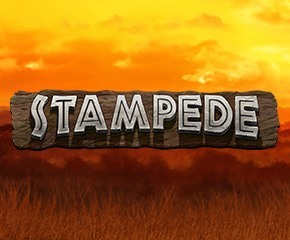 Eyecon presents to you a new kind of slot game by the name of Stampede. The theme of this slot game is that of a Safari. The free games bonus feature that it comes with adds to the excitement level of the game. You can choose from a lot of options of free spins that come along with various multiplier options. Get 20 free spins and you can double your winnings. With 5 reels, 243 paylines, this African-safari based slot game has good payouts. The added level of excitement is achieved by the bonus round and the number of free spins and multipliers can be chosen as per your need. Choose from 20 free spins with a 2x multiplier or you can go for 4 free spins with a multiplier value of 10x. Choose the Stampede slot game starting at 25p per spin or you can go for £50 for a spin which is the maximum wager level. There is a sun-kissed destination of Savannah in the background which makes up for the design of the game. The reels which are present in the game come in bright colours and there are playing card values serving as symbols for the Stampede slot game. These values range from A to 9. Wild symbols are also present as symbols. The symbols including Rhino and the Wildebeest will pay out pretty well which is 20 coins. There is a cheetah as a symbol which pays out 32 coins and the lion that you shall see as another symbol will land the maximum of 40 coins. The Free Games Bonus Feature- Trigger the free games bonus feature by landing three, four or five of the scatter symbols. A cash prize can be won if you land 5, 10 or 50 times the wager value. A selection of free spins and multiplier combinations can be selected in this round. The other choices that you can go for is a 3x multiplier with 15 free spins, a 4x multiplier with 10 free spins, a 5x multiplier with 8 free spins or a 10 multiplier along with 5 free spins. This feature can be retriggered if you are able to land the elephant scatter again. 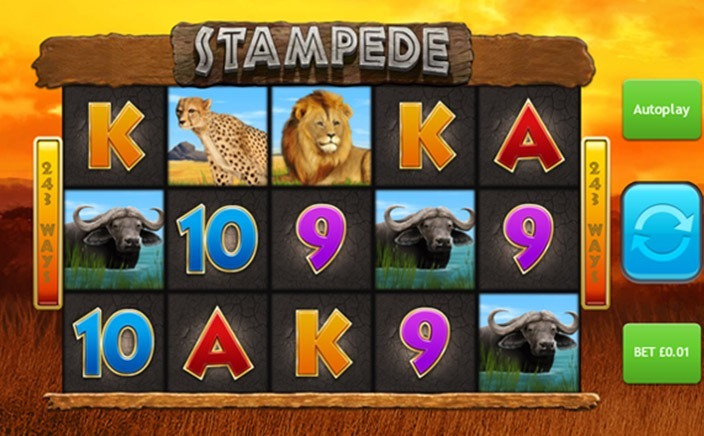 Experience the Stampede slot game and enjoy the Safari. Trick your luck into winning big payouts by availing free spins. The multiplier options can also be availed, and you can win 650 times the wager your put.